Many details from movies past slip easily from the mind. We may forget specific characters and even entire plot points, but the gnarly deaths wrought by the ‘80's best SFX gurus are never forgotten. They live on, shining bright, gore-soaked, and eternal. The clear standout is Polydoris’ plastic monument to Commando, appropriately titled “BENNETT (Letting Off Steam).” The figure depicts the character’s memorable end, with the traitor bleeding out around a pipe stuffed with a cloud of vaporous cotton. Here, at long last, is a Commando one-liner you can hold in your hands. 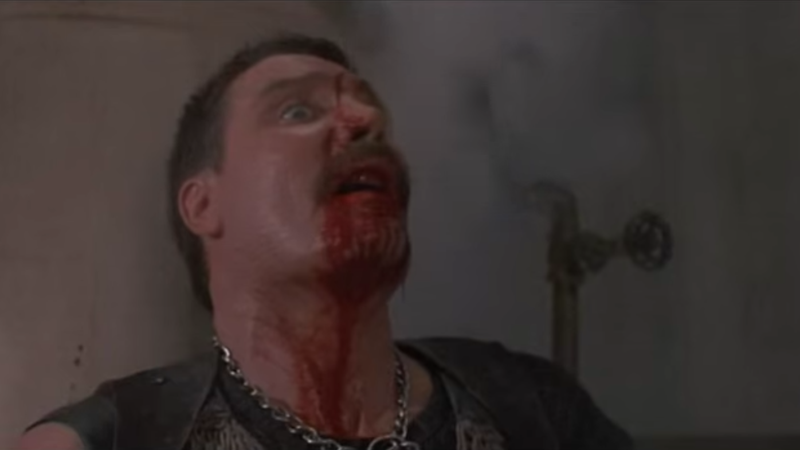 The rest of the toys follow in a similar vein, and include among them a miniature Hans Gruber falling backward to his doom; a viscera-soaked business man modeled on Scanners’ famous head explosion; an upsettingly dead Hooch from Turner & Hooch; and others drawn from Lethal Weapon 2, Rocky IV, Friday the 13th, and Top Gun. Polydoris has been at this kind of work for a while. In the past, he’s created a doll of Nic Cage’s character in Mandy, a “toy” cotton ball based on The Fog (“Just like the real thing!”), and more odes to the weirdest corners of pop culture. If you don’t believe us, just consider that Polydoris, the madman, even as a gift for the Lance Ito fanatic in your life.